Spirited Media has sold The Incline, one of its three local news sites targeting millennials. 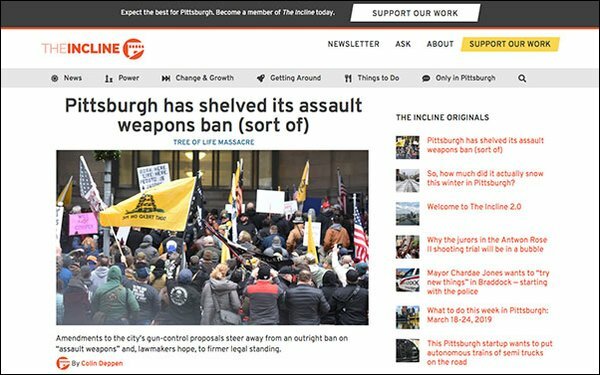 WhereBy.Us, which currently owns sites in Miami, Seattle, Portland (Oregon) and Orlando, bought The Incline, which debuted in 2016 to cover Pittsburgh. The WhereBy.Us’ properties post a weekday morning newsletter. The Incline, which had been sending a seven-day-a-week newsletter, will scale back to five. Spirited media previously sold Denverite to Colorado Public Radio in early March. Billy Penn, which focuses on Philadelphia, is still for sale. “The Incline will still be Incline-y. We’ve still got our sass and Pittsburghese,” The Incline’s staff wrote in a post. “We’ll keep monitoring the city, highlighting bright spots and challenges …"
Rossilynne Culgan, the site's food and culture editor, has been named director. Former director Lexi Beculfine moves to The Philadelphia Inquirer. WhereBy.Us claims more than 75,000 daily subscribers across its network, reaching over 3 million people each month cross-platform. Since launching in 2015, it has raised more than $2.5M to support growth and generated $1 million-plus in annual revenue. Chris Krewson, Spirited Media's vice president of strategy, tweeted it was a “bad time to raise money as a local media company.” Instead, the company will move to the consulting side of the business.